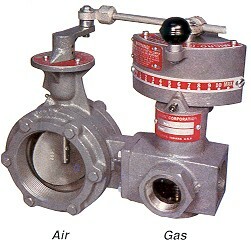 MICRO-RATIO Valve assemblies are used for air, gas and oil proportioning control. The multiple screw cam assembly provides mechanical adjustment capabilities to the air/fuel ratio at each valve position throughout the entire capacity range of your burner system. Throttling range is fully adjustable and designed to operate over the extremely wide turndown capabilities of Maxon's modern burner systems. Stand-by fuel requirements are simplified by using tandem-linked "air-gas-oil" valves to provide single point control for multiple fuel or multiple zone systems. SYNCHRO Valves may be used independently for individual adjustable gradient fuel flow control, or in tandem with other fuel control valves for more sophisticated multi-zone control applications. Totally enclosed cam option is available for greater protection against hostile environments. 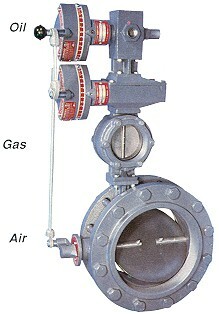 Smaller sizes of SYNCHRO Valves use characterized "V" ports in a poppet disc for greatest refinement of control. Larger sizes feature a butterfly-type disc for maximum capacity with minimum pressure drop for gas or air flows.